DAZN wants you to choose if you're in or out. It’s been a bananas week on the OTT sports streaming services front, with ESPN extending and expanding its partnership with the UFC and the AAC to further bolster ESPN+. Now DAZN has made a pretty significant move in announcing some pricing changes in an announcement posted on their website, announcing they were doubling their monthly subscription fee to $19.99. DAZN previously cost $9.99 a month. Unlike other subscription services, there was no annual option that allowed you to pay more up front, but less on a month by month basis. Using my undergraduate business degree from a state school, I can tell you that is good for the company because you’re getting revenue in the door upfront while also getting a longer term commitment (albeit at a lesser margin). Users who have already signed up for the $9.99 monthly fee will get another year of that monthly rate before the increase goes into effect, which means current subscribers do not have to locate their pitchforks just yet. DAZN has also decided to offer an annual subscription, and it’s not a small discount by any means – especially with the new $19.99 monthly fee in play. The new offering will cost you $99.99. For those arithmetically challenged, that’s a $20 savings on the previous yearly cost (paying on a month by month basis). With the monthly price increase, new subscribers would now be saving a startling $140 by just nutting up and paying for an annual subscription opposed to letting a new subscription roll over from month to month. With DAZN’s combat sports heavy US programming options, fans who wanted to watch a few boxing fights a year would just subscribe for a month before canceling and eventually resubscribing, and thus would only rack up a few $9.99 charges. They’re now being asked to make a decision: do you want to pick and choose your months now that the cost has been doubled, or do you just want to commit to the whole year? At $19.99 a month, five months would cost the same as an annual plan. While price increases never go over well, I think the reality is that a handful of the fights on DAZN are PPV quality fights, or at the very least would have been shown on premium cable. Subscribing for a few select months a year at $9.99 per month was a pretty damn good bargain, opposed to ponying up ridiculous $50-$100 PPV fees to watch a fight. DAZN’s price increase does take money out of the pockets of fans, especially if they continue to pick and choose months they want to subscribe, but I think similar to MoviePass, the initial pricing just wasn’t a sustainable model long term. You’re seeing this for a lot of subscription services who roll out an initial bundle price, continue to improve their services to gain more subscribers, and then increase the monthly fee down the road. It’s very possible ESPN will have to increase the cost of ESPN+ sometime over the next year or so as they put more meat on the bone and offer more exclusive live content. People who want to watch DAZN fights now have the option between paying for what amounts to a $20 PPV, including additional fights and other programming (most notably, their new MLB show), or just doing the math and plunking down $100 and being covered for the year. It will be interesting to see what other content DAZN will be able to add with the aim of keeping people subscribed throughout the year. ESPN has begun to leverage their existing relationships to move programming onto ESPN+ for more year round content, and has the 30 for 30 series and other docuseries as evergreen content anchors to keep people from opting out during lulls in the sports calendar year. Perhaps we’ll see DAZN launch documentary content of their own, considering HBO always paired boxing documentary content with their fights and programming. Some others believe DAZN could make an aggressive bid to acquire NFL Sunday Ticket, which they already control in Canada. Given I’m a pretty casual boxing fan, I asked boxing insider Mike Coppinger his thoughts on the pricing change. 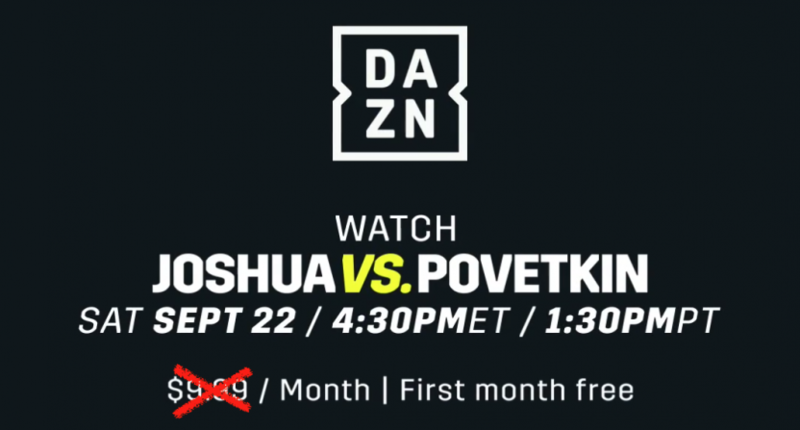 For now, DAZN seems to be pretty content disrupting the traditional boxing broadcasting paradigm in the US market. That’s not a bad bet, as it feels pretty awful to pay a little under $100 for a fight that may end up being terrible. It will be interesting to see if they extend their American offerings beyond combat sports and acquire sports rights for more broadly watched sports leagues and conferences, but for now, the MoviePass for boxing (I’m now using this going forward because I HATE HATE HATE how they’ve tried to brand themselves the Netflix of Sports) seems like a reasonable path for them and an attractive option for boxing fans.